Starting at the southwest end of Glenveagh Valley running along a narrow path through the Bridle Pass, into the grounds of Glenveagh Castle and up and over Gartan Mountain (200m height) to Gartan Lake. A marked route up and down Mount Errigal. Terrain is varied, including bog nearer the base and scree further up. From the bottom of Errigal a short cycle approx 3.5km to Dunlewy Centre and the Kayak transition. There is a time out at the kayak transition except for those in Wave 1 competing for a podium position. The boats are tandem sit-on-top kayaks. You will paddle a looped course on the lake. Cycle back on to the R251 turning left. At the next T Junction turn left on to the N56.After approx 3km in Gweedore turn right on to the R258 into Bunbeg. Turn right at the T-junction and follow marshals and sign posting to Inishcool Beach. 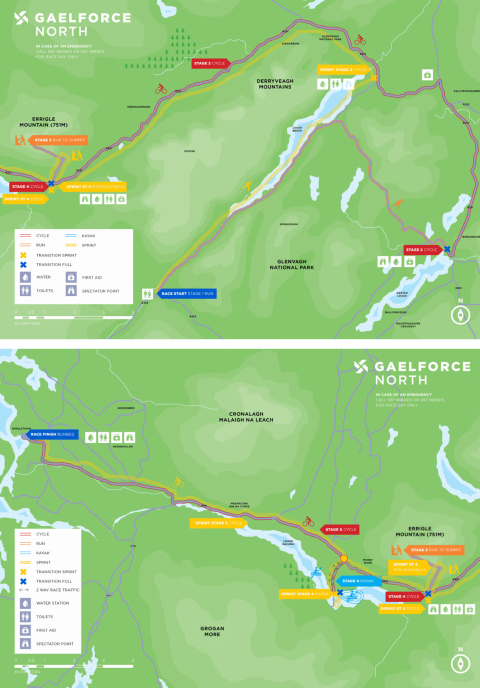 Cycling on sealed roads through Glenveagh National Park and alongside the Derryveagh Mountains, to Errigal Mountain. From the bottom of Errigal a short cycle approx 3.5km to Dunlewy Centre and the Kayak transition. There is a time out at the kayak transition except for those in Wave 1 competing for a podium position. The boats are tandem sit-on-top kayaks. Paddle a looped course on the lake. Cycle back on to the R251 turning left. At the next T Junction turn left on to the N56. After approx 3km in Gweedore turn right on to the R258 into Bunbeg. Turn right at the T-junction and follow marshals and sign posting to Inishcool Beach.